Ramon made us a snack that he used to make for himself as a little kid, sneaking two or three of these before dinner times. 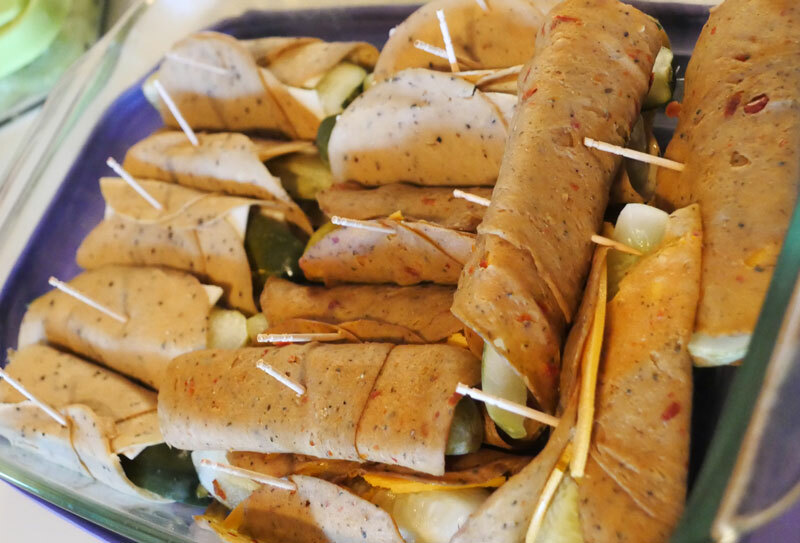 He assembled these cold cut burritos by wrapping vegan cheese and deli slices around dill pickle spears, pinning them together with toothpicks. He made two varieties: one with Peppered Tofurky Slices and Follow Your Heart Pepper Jack, the other with Italian Style Tofurky slices and Daiya Cheddar Slices. 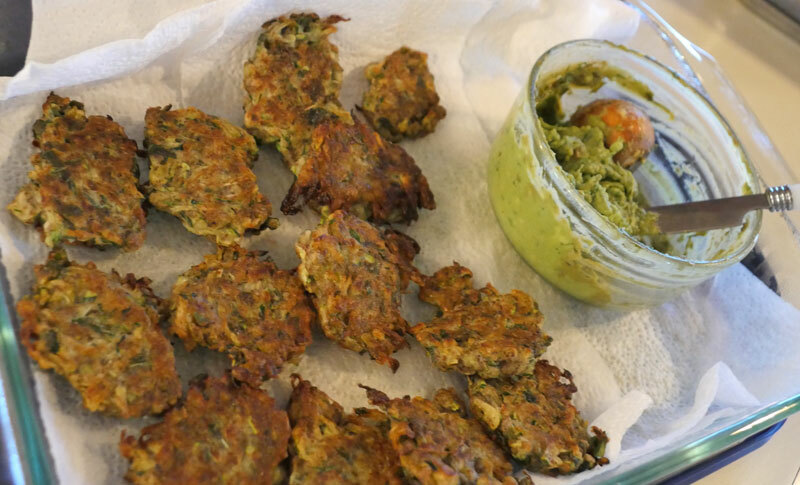 Shannon made these fritters out of shredded zucchini, flour, lemon zest, fresh basil and oregano, garlic, onion powder, salt, pepper and a flax egg for binding. The spread, described as a dip in the recipe she followed, involved avocado, Vegenaise, fresh dill, and onion powder. For dessert, Shannon decided to make a flan-like cake she had enjoyed during her time participating in a foreign exchange program in France. 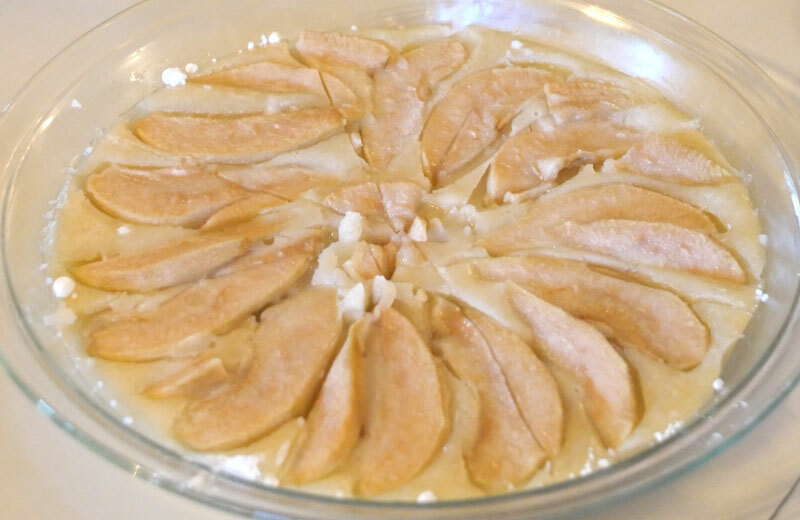 While Clafoutis is traditionally made with black cherries, she adapted a recipe for a raspberry clafoutis to make one with pears (the fruit she had handy). She veganized the recipe by substituting coconut milk and Ener-G Egg Replacer for their non-vegan counterparts. It also contained flour, sugar, and lemon zest for a wonderful citrus spark. Slynn decided to make these Peanut Butter Oatmeal Cookies because it meant she wouldn’t need to go to the store for ingredients. 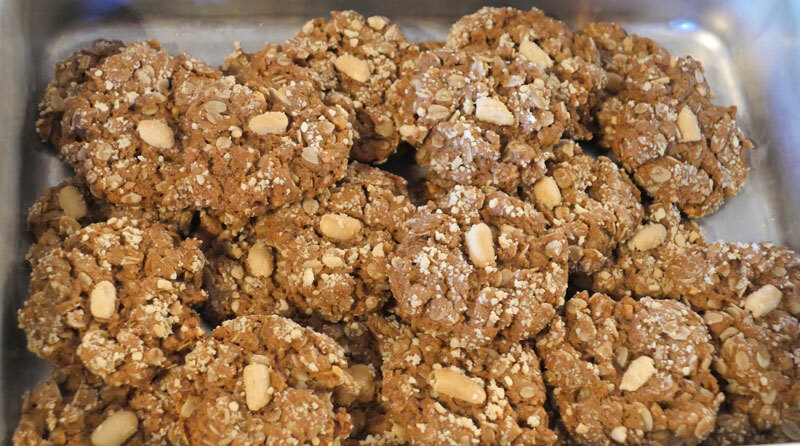 Both pretty and delicious, with a perfect amount of chewiness, these cookies delighted us with peanut butter, rolled oats, cinnamon, brown sugar, and crushed peanuts for an additional layer of texture. Lilly prepared a caramel sauce and a spreadable chocolate for this treat. She made the caramel sauce with vegan butter and brown sugar. 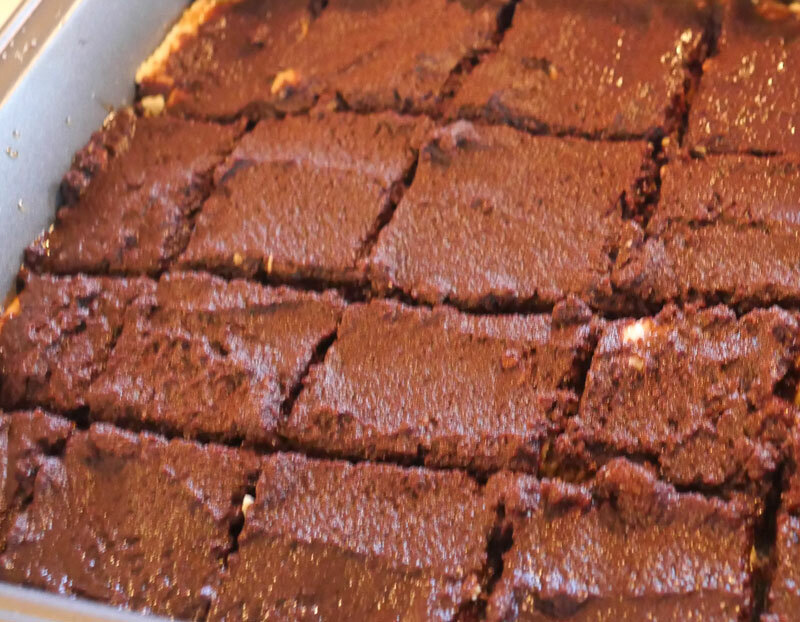 For the chocolate element, she melted chocolate and coconut butter together. She put the caramel over the tops of saltine crackers then spread her chocolate on top. Caroline and Drew made cold pizza, a classic late night snack. They put it together with store bought pizza-style flat bread crust and a jarred pizza sauce, both acquired from Denton’s Cupboard Natural Foods. 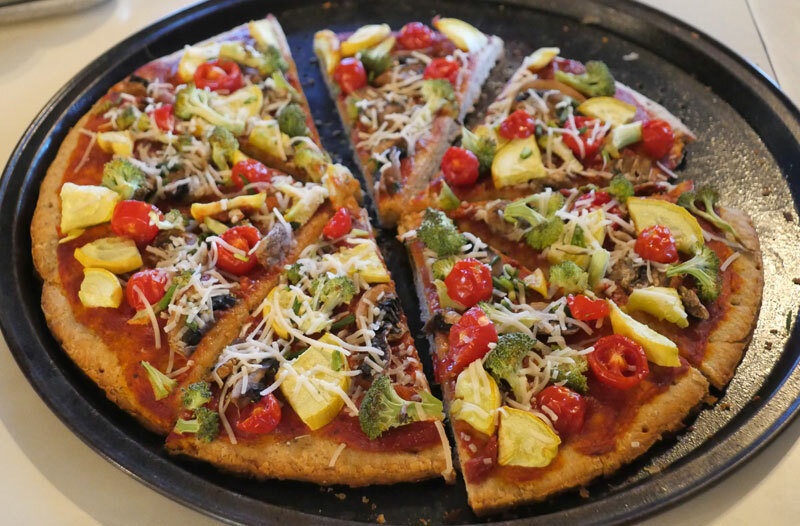 They topped it with Follow Your Heart Vegan Parmesan shreds, sliced cherry tomatoes, yellow squash, broccoli, mushroom, and home grown green onion bits. They also took the the time to prettily slice us some fresh kiwi because, as they told us, if you eat two and a half to three kiwis before bed, it is supposed to help you sleep. 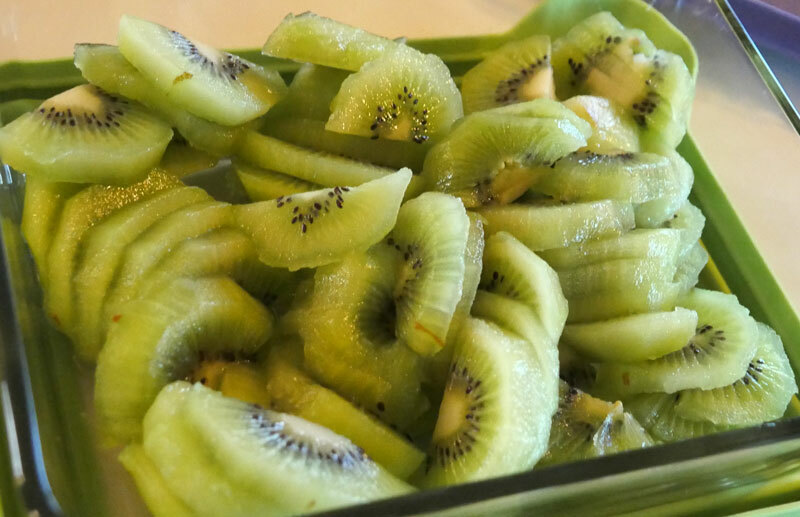 That’s a lot of kiwi–good thing it is nice to eat! 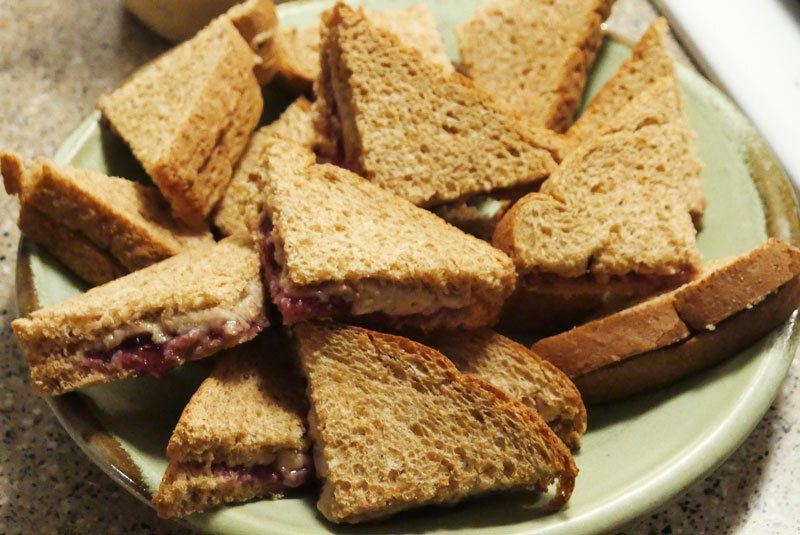 Billy made his mini sandwiches with homemade jelly he concocted from wild mustang grapes picked from his backyard fence plus sugar, water, and pectin. 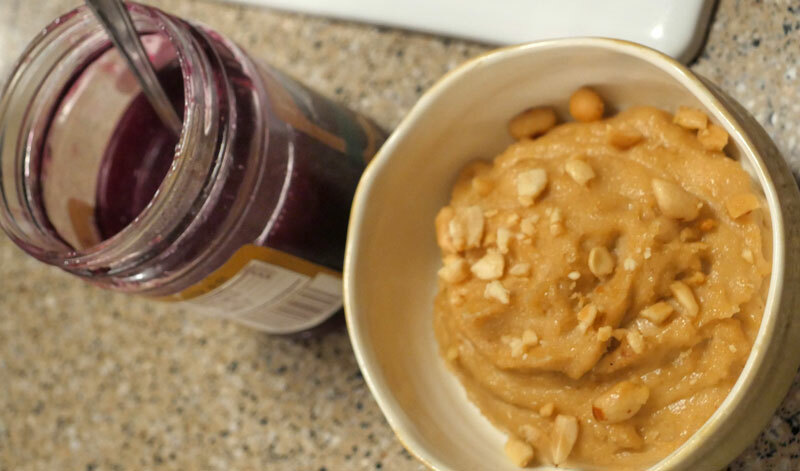 He made the peanut butter by grinding cocktail peanuts in the food processor with olive oil, water, and sugar. He ran out of time to make his own bread, but luckily he had picked some up from the store. 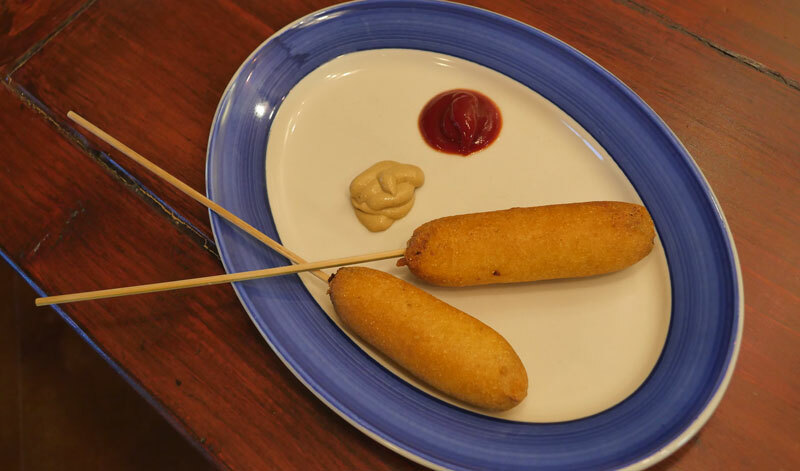 Since Lauren will not be attending Texas Veggie Fair in October this year, she decided to make homemade vegan corn dogs to compensate. She made a batch of vegan hot dogs then dipped them in a cornmeal/flour batter before frying. She served them with ketchup and mustard. 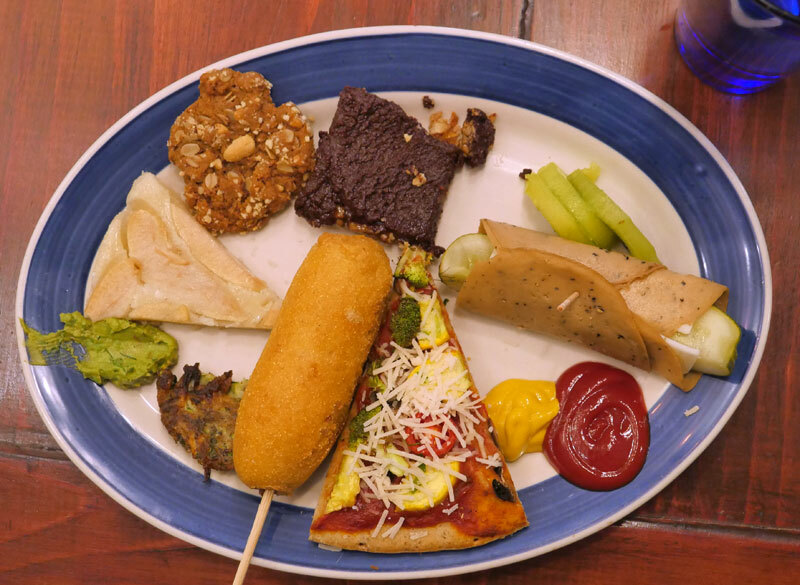 2 Responses to "September 24, 2016 – Late Night Snack"
Those corn dogs were awesome. Everything was so good! Also, when I was testing the waters on veganism, hunger was the one thing that could get me to eat something vegetarian instead. 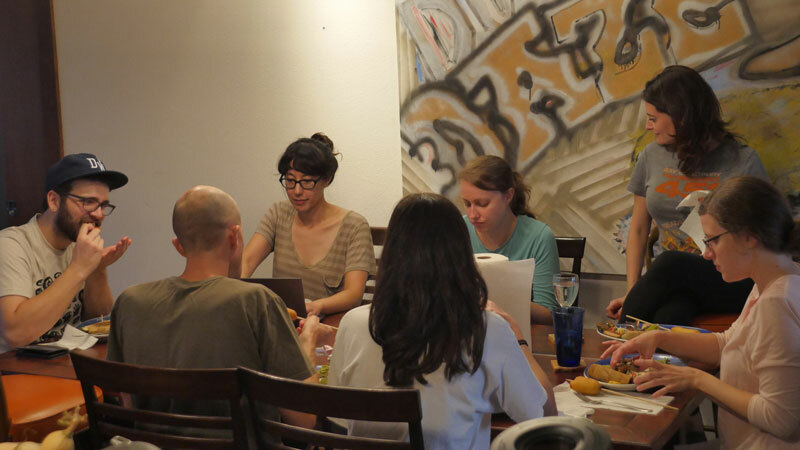 I had just put it out on a vegan support page, as to what to snack on as a vegan, and some kind angel shared this article with me!